A.H. Aldridge is one of the leading businessmen of Roberts, the business of which he has charge being one of the principal industries of the village. His career has been one of active participation in the grain business since early youth. He was born in Milwaukee, Wis., October 9, 1861, a son of Stephen Adridge. His father and mother died in Milwaukee. He received a good education and then took up the grain business, thoroughly mastering every detail. In 1882 he came to Roberts and started buying grain, an occupation for which his wide knowledge of grain conditions and market makes him eminently fitted and suited. At the present time he is secretary of the Wisconsin Elevator Company, which consists of three men, owning ten elevators and handling over 1,000,000 bushels of grain annually. Mr. Aldridge is one of the stockholders. He owns a handsome town residence and also 160 acres of land in the township. He is an up-to-date man, and his combined city and country training has made him a man whom it is well worth while meeting. Everything that he possesses he has made by his own hard labor and business sagacity. In 1887 he was married to Laura Lamson, daughter of David Lamson, of whom a sketch will be found in this history. Three children have blessed this union: Stephen is a graduate of the high school at Hudson, Wis., while Lucile and Alice are at home. Mr. Aldridge votes the Democratic ticket and for many years served as town treasurer. He is a good citizen, well liked by all. A.G. Anderson is one of the early settlers of this part of the country. He remembers the time when his people were one of four families of white folks in Pierce county, this state, the remainder all being Indians. He has seen as many as 500 Indians together, some of them still savage, and decked in all the paint and feathers of war. He saw the beginning of the first building that was ever erected in River Falls, Wis., and has many interesting stories to tell of the days when all kinds of wild game, including deer, wolves, wild cats, etc. Abounded in wilds where populous villages now stand. Mr. Anderson was born in Norway, November 5, 1847, a son of Guturm and Christina Anderson. His parents came to the United States and settled in Pierce county in 1853. The father has followed farming all his life and is still living in River Falls, being over ninety-three years of age. A. G. worked on the farm and attended school in his earlier days, afterward working in the woods until twenty-six years of age. He then spent six years in a flour mill, being manager of all the teams and teamsters. After this he rented a farm for two years, then came to Forest township, St. Croix county, in 1881. He purchased a place in the woods and cleared the land, making many improvements. He now owns 236 acres of land, 160 being under the plow. Mr. Anderson still clings to the memories of early days and continues to reside in the log cabin which he built when he first settled here. He carries on general farming, raising some stock and selling considerable cream. Mr. Andersons wife and children have all helped to make the home, and Ray and Victor are the principal farmers on the home place now, doing most of the work. Mr. Anderson was married in 1877 to Semelia Headmark, daughter of Andrew and Sophia Headmark, by whom he had eight children; Augusta was a dressmaker. She married Michael Dorgan, of Hudson, and died in the month of March, 1908. Hilda is a dressmaker; Tobie received his education at McCoys bank in New Richmond, Wis, and is now cashier of a bank in Tacoma, Wash.; Clyde is a graduate of the Canton Business College at Minneapolis, Minn., and is now bookkeeper for the Northwestern Telephone Company at Fargo, N. Dak. ; Ray is at home; Sadie is a school teacher, and Victor and Frank are at home. Mr. Anderson is a Republican in politics and has served on the side board for six years. He has also been school trustee for five years. He is an honest, hard working man, who has earned everything that he possesses by his own labors. The family are members of the Methodist church. Daniel Anderson was an early settler, coming in 1850. He engaged in lumbering on Willow River; he kept the leading hotel in Hudson, which was burned in 1854; he rebuilt and went on until 1866; his hotel again burned with no insurance. In 1876, 1877 and 1878, he was City Treasurer. He died July 8, 1878, very highly respected by the people of Hudson and a large circle of acquaintances. Henry Anderson, lawyer, is a native of Norway, born in the month of January, 1855, a son of Andrew and Bertha (Nelson) Anderson, who were respected residents of the old country, where they lived and died. Henry received an excellent education in his native land, and in 1874 located at Madison, Wis., afterward coming to Baldwin, in 1875. He started work on a farm. Subsequently he attended the schools of Madison for two years, supplementing the excellent education, which he had already received, with training in English. He studied law in the office of H. F. Woodward, Senator Clapp and Armstrong Taylor until 1883, when he was admitted to the Wisconsin bar. He started the practice of his profession in 1884 in Cumberland, Wis., and after nine months came to Baldwin, where he continued to follow his profession until 1905, when he was elected cashier of the Bank of Baldwin, in which capacity he has since remained. During his years of labor as an attorney he was actively engaged in politics, being a staunch adherent of the Republican party. He has been chairman of the county board and of the county Republican committee. He has also held several town offices, and was elected to the state legislature, 1901, where his services attracted favorable attention. He is a member of the Masonic order, being a Knight Templar. His name also appears on the membership roll of tyh Independent Order of Odd Fellows and the Modern Woodmen of America. He was married in 1886 to Lizzie O. Falck, by whom he has three children: Axel is a bookkeeper in the bank; Bert S. graduated from the Baldwin High school and now works for a Duluth wholesale hardware house, and Elmer is at home. James Amasa Andrews comes of old Revolutionary stock, his mothers family being among the patriots who lived in Colonial days. His father, Amasa Andrews, was born in Herkimer county, New York, July 9, 1801, and came to Hudson, Wis., in the fall of 1853, following his twin brother, Ammah, who came here from Stillwater, Minn., in the spring of 1848. Amasa was married December 31, 1831, to Mary Comstock, born in Owasco, Cayuga County, New York, daughter of Elkariah Comstock, the first Protestant clergyman sent into the interior of the state of Michigan. The mother of Mary (Comstock) Andrews was a niece of General Nathaniel Greene, one of the officers of the Revolution, and the grandmother was Abigail Dodge, a relative of General Dodge, also of Revolutionary distinction. Amasa Andrews was a contractor and builder, and many of the houses still standing in and about Hudson testify to the enduring quality of his creations. He was the father of seven children, six of whom grew to maturity: Edward C. died in the Black Hills in 1902; Sarah E. and Mrs. Mary A. Chambers died in May, 1898; Mrs. Cecelia Hughes lives in Anoka, Minn.; James A., the subject of this sketch, was born in Commerce, Mich., April 23, 1845; Charles A. died in 1872. The father, Amasa Andrews, died August 10, 1880, and the mother passed away December 23, 1882. 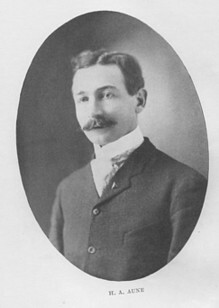 Alfred G. Armstrong, cashier of the People's National bank, is the son of Thomas S. and Rebecca (Boys) Armstrong. He was born in Guelph, Ontario, November 12, 1860. His father was born May 18, 1817, in Michigan, and the mother May 25, 1832, in Canada. They were married in Guelph Township, Ontario,. Alfred G. is the third of a family of sixteen children, all of whom still survive. John R., of Spring Valley, is the only other one in the United States. Andrew Arnquist was born in Sweden, June 20, 1842, son of N. M. and Annie (Asp) Arnquist, who left their native country and settled in Star Prairie, St. Croix county, Wis., in 1869. He attended the common schools of Sweden and then worked at the lumber business, laboring in sawmills in the summer time and in the woods in the wintertime. Upon coming to America in 1866 he worked on a farm near Red Wing, Minn., six months and then attended school for a similar period. In 1867 he came to Star Prairie and took up farming and lumbering on Apple river, which at that time was one of the centers of lumbering activity in this section. Two years later his parents came to America and settled in the same town. In 1875 Mr. Arnquist purchased 160 acres in Star Prairie Township. House and barns soon adorned the property, and the numerous outbuildings were not long in building. For several years the principal crop was wheat. Later Mr. Arnquist took up general farming. Among the buildings on the farm that never fail to attract the attention of persons passing the place is a large and modern barn, built in 1908, at a cost of over $1,500. Mr. Arnquist was married in Star Prairie, May 4, 1876, to Christina Johnson, a daughter of John and Carrie Johnson, well known farmers of Sweden, who lived and died in the old country. This marriage was blessed with six children. Edna, the oldest, taught school for a time and is now the wife of William Giberson, of Cantlean, Idaho. Mabel, the second daughter, is now a schoolteacher. Inez teaches school at Seattle, Wash. Ida is a telephone operator at Cantlean, Idaho. Victor and Erving are at home on the farm. Edna, Mabel and Inez graduated from New Richmond, Wis., High School. By a previous marriage Mrs. Arnquist had two children, Hilda and Carrie Paulson, the latter of whom is now deceased. Mrs. Arnquist passed away in the month of March, 1903, at the old homestead, where she had been brought as a bride and where she had spent all of her married life. Mr. Arnquist has always taken a deep interest in public affairs and has been honored by his fellow townsmen of Star Prairie with such positions as side supervisor, director on school board and assessor, the latter position having been held by him for a period of five years. He is a staunch Republican and attends the Lutheran church. There were nine of the Arnquist brothers and sisters, all of whom have had a part in the development of St. Croix county, Wisconsin, in the city of Little Falls. Andrew was the second child and the oldest boy of the family. Nels is a farmer of Star Prairie Township. Christiana lives in the same township. John M. lives in Stanton Township. Mrs. Annie Homquist is now dead. Mrs. Carrie Libby lives in New Richmond. The eighth child is Judge Arnquist, of Hudson, and the youngest is Mrs. May Anderson, of New Richmond. C. W. Arnquist was born in Red Wing, Minn., in 1871, a son of Nels Arnquist, a successful farmer, whose sketch appears in this volume. He received a common school education in the public schools and finished with a business course at Gustavus Adolphus College, St. Peter, Minn., graduating in 1893. He worked with his father and farmed until 1896, when he began clerking for E. A. Glover, of New Richmond, dealer in general merchandise. In 1903 Mr. Arnquist started business for himself in his present store, succeeding the Rulein Brothers & McNally. Upon purchasing the store, Mr. Arnquist added a grocery department and later a dry goods annex. He now has the largest store in New Richmond, and his place bears the name "The Big Store." In 1907 McNally, who had been his partner, severed his connection with the concern and Mr. Arnquists brother-in-law, L. A. Libby, and his brother, Elmer Arnquist, became interested in the business, which is now operated by these three gentlemen. C. W. Arnquist is the largest stockholder. He was married in 18to Agnes Libby, daughter of Lyman and Caroline (Arnquist) Libby. By this marriage there are two robust sons, Warren N. and Robert L. Mr. Arnquist is a Republican in politics and belongs to the I. O. O. F. For many years Mr. Arnquist had up-hill work in building up his business. He worked night and day thoroughly determined to succeed and was not daunted by any obstacle. He has reaped the reward of his toil and now does the largest business in the city, carrying a stock of $20,000. He stands well among his fellow townsmen, and is known far and wide for the honesty of his business methods. John M. Arnquist is one of a large family of brothers and sisters who have made their names honored and respected throughout the community. He was born in Sweden, July 13, 1851, son of Nels M. and Anna (Asp) Arnquist, who settled in Star Prairie, St. Croix county, Wis., in 1868. John M. received a common school education in Sweden, and after settling in Star Prairie with his parents he attended school at Huntingdon; then he bought, improved and sold land. In 1878 he bought 120 acres for himself, which he improved, erecting a large house and roomy barns. Upon this farm he carried on diversified farming, raising grain and livestock. Here he continued until 1901, when he sold out and bought 240 acres in Stanton Township, in the same county. He at once set to work developing this land, and he now has 190 acres under the plow. The buildings, which he erected, include a large barn built in 1902 and valued at $2,000. A beautiful new house erected at a cost of $4,000 is just completed. It is one of the finest houses in the township, with all modern conveniences, including hot-air heat, hot and cold water, bathtubs and a large air pressure tank. Near the house is also a 100-foot cement well and windmill of great power. Mr. Arnquists progressive spirit is shown by the fact that he has christened his place the Fair View Stock Farm. The horses raised on this farm are known far beyond the borders of the state. William H. Ash is a native of Fond du Lac, Wis., born in April, 1852, son of W. D. Ash, a stock buyer, grain dealer and merchant, who settled in that county in the early days. William H. received a common school education and then took a course in the high school. He worked at farming and clerked in his fathers store until 1902, when he came to St. Croix county and bought the farm of 180 acres in Warren township, which his son Leland now manages. Shortly afterward he bought an interest in the State bank, of Roberts, and became its cashier, in which position he has since remained. Mr. Ash was married in 1872 to Martha Hales, of his own native county. This union has resulted in four children: Leland, on the farm; Frank, assistant cashier of the bank; Bert, bookkeeper in the bank, and William E. Ash. Mr. Ash votes the Democratic ticket and affiliates with the I. O. O. F. He is a public spirited and successful citizen and is regarded as an authority on financial matters. The bank of Roberts is an excellent institution. Its report, May 14, 1908, was as follows: ResourcesLoans and discounts, $40,418.46; overdrafts, $242,62; banking house, $1,064.17; furniture and fixtures, $1,561.52; due from banks, $2,374.45; checks on other banks and cash items, $606.85; cash on hand, $1,323.73; total, $47,691.79. LiabilitiesCapital stock paid in, $5,000; undivided profits, $606.11; individual deposits, subject to check, $17,572.70; time certificates on deposit, $24512.02; savings deposits, .96; total, $47,691.79. Hans A. Aune, superintendent of the public schools of St. Croix County, is a man of marked scholarly attainments. He is also an athlete and an orator, being a fine type of the modern educators who combine manliness of character and muscle with geniality of personality and knowledge of booklore. Mr.Aune is the son of Carl R. and Indiana (Alte) Aune, natives of Norway, who came to America in the early 70s and located in Baldwin Township, St. Croix County, Wisconsin. They purchased sixty acres, broke the land, erected buildings and carried on a general farming industry with considerable success. The father served as treasurer of the township four years and was on the school board for a considerable length of time. He is also one of the leading progressive Republicans of Baldwin township. The mother died in the fall of 1906 and the father still resides on the old homestead. Hans A. received his elementary education in District No. 1 of Baldwin township and in Baldwin village. After teaching nearly three years he went to the high school at Menomonie, Wis., completing the course there, and in 1904 was graduated from the State Normal school at River Falls, Wis. In all his school days his ability as a pupil was marked. He had not been studying many years before his teachers realized that he was a child of unusual attainments, and he was scarcely of high school age when older people, who became interested in the career of this bright scholar, advised his parents to make a teacher of him. He early became imbued with that ambition himself, and it is greatly to his credit that he worked his own way ever since he entered the graded schools. While at Menomonie he was known as a brilliant talker, and at graduation was the class orator. At River Falls he was on the school debating team. He also won considerable note during his schooldays as an athlete, being a football expert and baseball player, as well as captain of a fast basketball team. Mr. Aunes teaching experience embraces both district and graded schools. He taught very successfully in the common schools of the townships of Equ Galle, Cady and Somerset. In all of these towns he was offered increased salary to return, but each successive step that he took brought him nearer to the goal of his ambitions. In the month of September, 1904, he commenced teaching in the state graded school of Somerset, being principal of the school. During that year he was elected county superintendent of the schools of St. Croix County. In this connection he has served nearly two terms, giving general satisfaction. He is respected by the pupils, honored by the teachers and liked by the parents. He makes his headquarters in the village of Baldwin, where in the spring of 1906 he purchased a beautiful house at the corner of Main and Third streets, valued at $2,500. He also owns three nice building lots in another part of the village. Mr. Aune was married November 9, 1905, to Hannah E. Anderson, of Eau Galle township, Wisconsin, daughter of Andrew A. and Nellie (Hanson) Anderson, natives of Norway, but now prominent farmers in Eau Galle. This union has been blessed with one child, Blance Genevieve, born March 15, 1908. Mr. Aune is a progressive Republican and a member of the Lutheran church. He is so well known that comment upon his work is almost superfluous. He is an untiring worker, a true gentleman, and a clear reasoner, and to say that he is ably fitted for his honored position is to sum up, in a word or two, the numerous compliments that have been showered upon him, not only by the people of his own county but also by educators throughout the state.